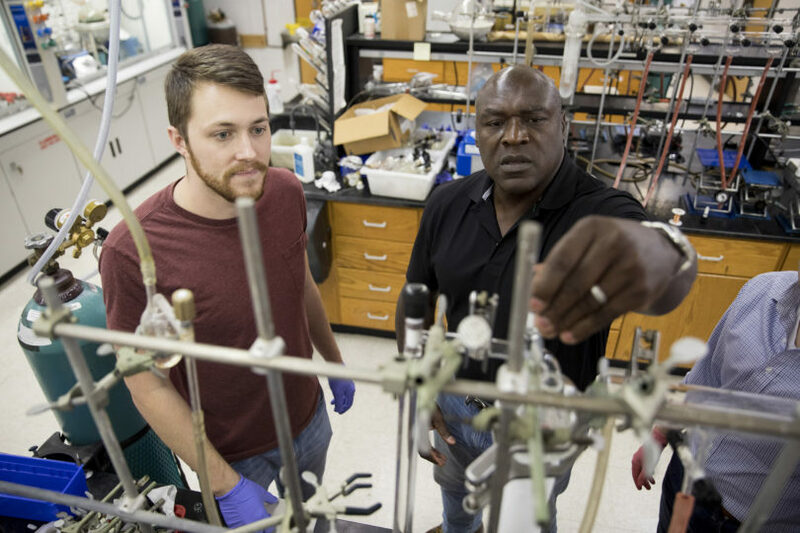 Gregory Robinson, Franklin Professor in the department of chemistry, works with a student in his research laboratory. The growth in expenditures "signals the University of Georgia’s role as one of America’s great research universities." The University of Georgia climbed seven spots to No. 54 among all U.S. universities, colleges and research institutions in the latest National Science Foundation Higher Education Research and Development rankings. In the new rankings, which reflect fiscal year 2016, UGA’s total research expenditures reached $410 million, up from $374 million and a ranking of 61st the year before. UGA also advanced on the basis of federally supported research expenditures, ranking 79th with $144 million, up eight spots from the prior year. Data for fiscal year 2017 show continued growth in research activity, with $458 million in total research and development expenditures-an increase of 12 percent over fiscal year 2016. Whitten attributed the university’s jump in research expenditures to the dedication of existing faculty and strategic investments that include Presidential Faculty Hiring Initiatives. The university also has enhanced grant support services for faculty, including integrating and improving operations for Sponsored Projects Administration and establishing the Office for Proposal Enhancement. At UGA and other research institutions, federal agencies comprise the single largest source of research funding. HERD is the primary source of information on research and development expenditures at U.S. colleges and universities. The survey is an annual census that collects information on research and development expenditures by field of research and source of funds and also gathers information on types of research and head counts of personnel.